I’m Madilyn, ‘The Functional Nurse’. I am a Registered Nurse, specialising in Cosmetic Injectables and Dermal Therapies. I have spent nearly 10 years working on my patients’ skin health and educating them on how to create their glow from inside out and outside in. I myself have suffered with inflamed/ reactive skin since a young age. Failed by the conventional medical system, I began to delve into the world of functional medicine. I now treat myself and my patients skin with a more holistic approach. Our skin is probably one of our most underrated organs. We lather it in hundreds of toxic chemicals daily, smother it in makeup and spend hours out in the sun destroying and denaturing our collagen for short term tans. We then want to find a new beaut cream or serum to help reverse the damage we have caused. But unfortunately it does not work that easily. A concoction of chemicals in serum form, can not reverse the toxic overload in your liver, or replenish good bacteria in your gut or increase the circulation of oxygenated blood throughout your body. This is where a ‘Holistic Approach’ to skin comes in. I am a big believer in following Chinese facial mapping to understand what myself and my patients skin are saying. Dermatology is a recognised specialty in traditional Chinese medicine. Traditional Chinese medicine treatments for skin disorders have been in use since 1100 to 221 B.C. 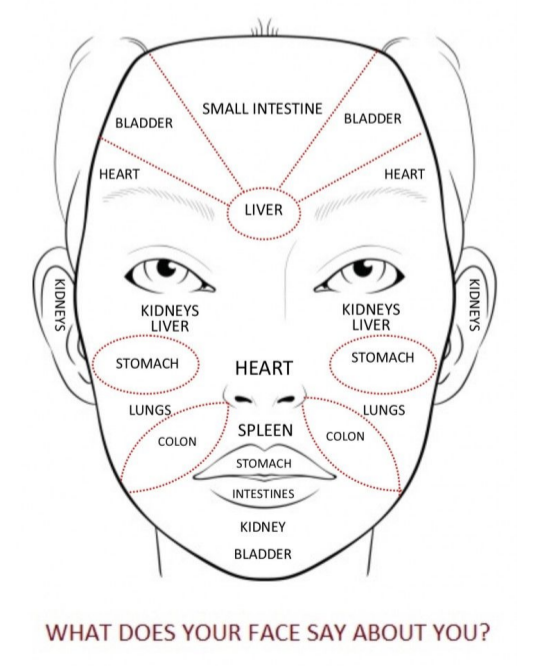 "Face mapping," is an ancient practice rooted in Chinese Medicine teaching.It is based on the premise that the entire body is reflected on the face, with each area relating to an internal body system. If there is an imbalance in that internal system, we (in theory) should see skin changes such as breakouts, milia, inflammation, discolouration and texture changes in the corresponding facial areas. By paying close attention to the connections within the body and its ailments, practitioners are often able to help more than one illness at a time, giving the more ‘holistic approach’. Internally the spleen provides the source of blood and gi (vital energy) and the lung is responsible for dispersing the blood and qi to the skin. 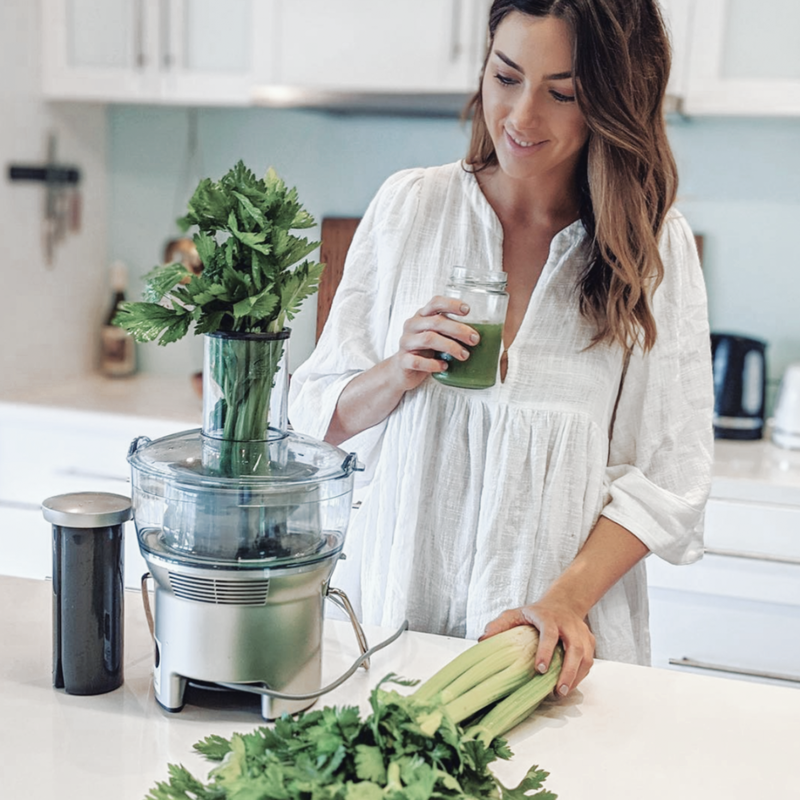 Along with these two organs, other bodily functions are also responsible for helping smoothness and health of the skin, such as our gut health, bowel motions and metabolic rate. Triggers: The intestines are majorly influenced by our nervous system. Recurrent skin concerns across the forehead can indicate an overactive nervous system and poor intestinal health. It may specifically indicate leaky gut, SIBO, or a bacterial imbalance. Recommendations: Focus on restoring gut health through micro nutrient dense foods high in good pre and probiotics. Reduce the strain on your liver by limiting stimulants, refined sugar and alcohol intake. Ensuring your water intake is at least 2-3L per day. Area: Nose and upper cheeks. Corresponding organs: Heart, Cardiovascular and the lymphatic System. Triggers: Poor circulation, high blood pressure, food intolerances, pollution, vitamin deficiencies. Recommendations: Reduce inflammatory foods, reduce refined sugar intake, increase antioxidant rich foods, have a blood test to determine any vitamin deficiencies. Maintain healthy cholesterol levels and lower blood pressure. Symptoms: Acne, cysts, congestion and inflammation. Triggers: Problems in these areas can manifest as irritable bowel syndrome, dysbiosis, bloating, bad breath, decrease or increase in appetite and inconsistent/ irregular stool movements. Inflamed cystic acne around your jawline is very often a sign of hormone imbalances and will typically find correlation with irregular periods, abnormal hair growth, use of contraceptive pill, Endometriosis or Poly-cystic ovaries. Recommendations: Restore the good bacteria in your gut with nutrient rich foods and probiotics. Ensure you are moving your body daily to excrete toxins and improve bowel motions. Ensure you are having a regular period, if you are on a contraceptive, avoid ‘skipping your period’ and interrupting your bodies natural cycle. If you're finding your skin is at a loss and you can't get it under control, just remember your skin is a tool of elimination. Your body is letting you know there is a form of toxicity that needs to come out, so try not to add more in! Take a look at what you're putting into and onto your body on a daily basis. Coffee, alcohol, the chemicals in manufactured foods, even some ‘health' foods (protein bars, juices, fruit bars etc), plus the products we put onto our skin (deodorant, perfumes, heavy makeup and hairsprays) are generally compiled of toxins. All of these products can make their way into our bloodstream causing a strain on our elimination system. As long as the toxic intake continues, your skin will be in constant battle to heal, no matter how much money you spend on products. In terms of treatment and professional guidance for your skin, the holistic approach continues. Just seeing your local beautician may not treat all areas of your skins aliments. I personally recommend incorporating a consultation with a Dermal Technician, Nutritionist and furthermore a GP, Chinese Medical Practitioner or Kinesiologist to give your skin a medical, physical and psychological approach to heal. 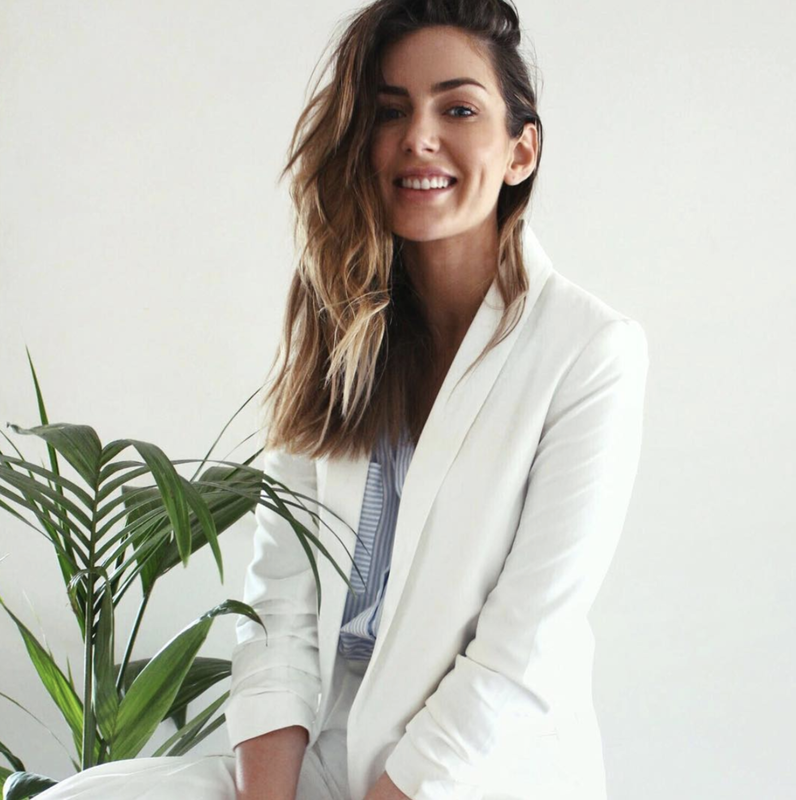 If you’re interested in holistic skincare and treating your skin from the inside out, Madilyn provides lots of great content on her blog and her Instagram! You can find her website here and check her out on Instagram @the_functional_nurse. If you need help evening out the complexion of your face this mask works a treat! If used regularly it should help clear and control your skin. Green clay is known for is absorptive properties and will help draw the nasty stuff out of your skin that you don't want in there (note: this means that the first few times you use this mask your skin might purge before it gets better - mine got bad for about a 4-5 days), if you keep at it you will see your skin start to look firmer and smoother. The mask also contains lemon, which has fantastic antibacterial properties, and apple cider vinegar. ACV also has antibacterial properties, but more importantly, it can help restore the pH balance of your skin and fade scarring.